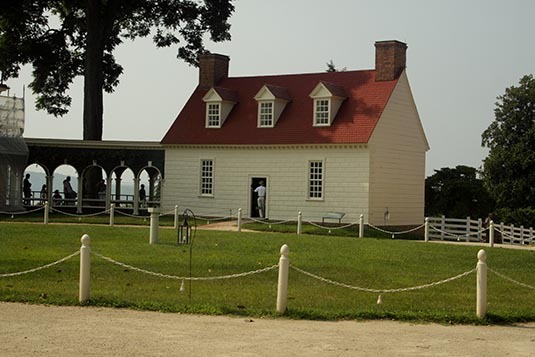 Mount Vernon, located near Alexandria, Virginia, was the plantation home of the first President of the United States, George Washington. 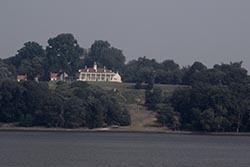 The mansion is built of wood in neoclassical Georgian architectural style, and the estate is located on the banks of the Potomac River. George Washington wrote "No estate in United America is more pleasantly situated than this..." Washington worked tirelessly for nearly 50 years to expand his plantation to 8,000 acres and to improve the appearance of the mansion, outbuildings and the gardens. I was in Washington, D.C. in a group tour organized by Mauiva Aircruise. 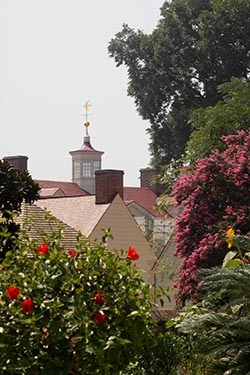 Our itinerary had scheduled a half day visit to Mount Vernon. After a hearty breakfast at Washington Hilton - our hotel for the previous night – we were ready to board “Spirit of Mount Vernon” at 8:30AM. 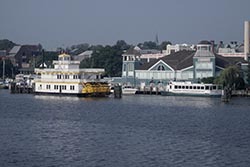 We cruised on River Potomac to reach Potomac River Waterfront & Wharf at 10AM. The Potomac River forms part of the borders between Washington, D.C. and Virginia on the left descending bank and Maryland and Virginia on the river's right descending bank. The entire lower Potomac River is part of the State of Maryland, with the exception of a small tidal portion within the District of Columbia. Except for a small portion of its headwaters in West Virginia, the North Branch Potomac River is considered part of Maryland to the low water mark on the opposite bank. The South Branch Potomac River lies completely within the state of West Virginia except for its headwaters, which lie in Virginia. With the description you would sense that the river must have been a source for dispute between the concerned States. When Washington, D.C. was being built, it was planned that a river next to the capital was of essence as was the trend in many popular capital cities of the world. Servicemen actually dug a trench to give access to the Potomac River. The evacuated soil was used to create parks along the banks of the river. The cruise departs from Pier 4 at 6th and Water Streets and covers the Potomac River with fascinating views of America's great landmarks and Washington's historic waterfront. Some prominent sights include Washington Monument, General's Row, Fort MacNair, National Airport, US Naval Research Lab, Old Town Alexandria, Admiral's Row, Woodrow Wilson Bridge and Jones Point Lighthouse. The Washington Family continued to live at Mount Vernon until 1860, when the estate and 200 acres were purchased by the Mount Vernon Ladies’ Association. Since that date, the private, not-for-profit organization has maintained and operated Mount Vernon for the benefit and admirers of George Washington. From the wharf, a 20-minute uphill wharf will bring you to The Mansion. However, a shuttle bus is available for transfers. We took the bus. Enroute we passed the George Washington Pioneer Farmer Site, 16-Sided Barn and the Slave Memorial. We alighted at The Lower Garden and walked our way to join The Mansion tour. There’s an entry ticket of $15 per person. However, this was included in our tour price. A volunteer greeted us and took us through the Mansion’s Servant’s Hall, Guest Bedrooms, Living Room, Private Chambers, George Washington’s Bedroom, Library and the Kitchen. Visitors must follow the volunteer and photography is not allowed in the Mansion. All exhibits within are original. After the tour, we were on our own. An hour was given to us as free time to explore the estate. Of course, that wasn’t long enough to visit each of the attractions on the estate. Had I the time and the weather kinder, I would have loved to walk to Washington’s tomb. Unfortunately, I gave that a miss. 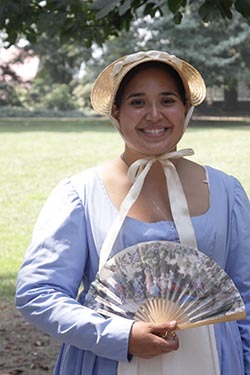 Ironically, George Washington used the services of over 100 slaves on the estate. Of course, he treated them well and left behind a substantial portion of his wealth in favour of his slaves. After a quick visit to Donald W Reynolds Museum (here you will see the most famous dentures in the world along with three life-size models of Washington created from a forensic investigation) and Ford Orientation Centre, I reached the food court to grab my lunch. At 1:45PM our bus was waiting to drive us back to Washington, D.C.